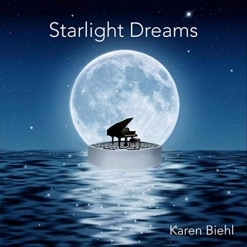 Starlight Dreams is the debut solo piano album by Karen Biehl, a violinist, singer and creator of guided meditations in addition to being a pianist/composer. Released in November 2018, the album was named “Best Solo Piano Album 2018” by New Age Music Guide and was voted one of their Top 10 albums of the year. It has also been nominated as “Best Neo Classical Album of 2018” by One World Music Radio. Biehl combines romantic classical lyricism with meditative empowerment to help listeners achieve an enhanced sense of peace, focus and self-awareness. On her website ( MaestraMusica.com) it says: “Musical meditations for self-transformation, healing and attracting the love of your dreams.” According to her bio, Biehl did just that by composing one of the tracks, “Invocation,” to her True Love in 1999, fourteen years before they actually met and became a couple. The twelve original piano solos on the album tell the story of Biehl’s lifelong connection to the stars as well as her dreams. (The thirteenth track is a more orchestrated version of “Meditation on a Moonlit Lake,” also one of the solos.) Each piece tells a story about the journey of longing for and realizing your dreams. While I appreciate Karen Biehl’s efforts, I really don’t like the sound of the digital piano she recorded with. I have played a wide variety of digitals and they just don’t have the sonority or expressiveness of a good acoustic piano. Many listeners probably can’t tell the difference, but as someone who has a good grand piano and is very fussy about it, the sound of a recorded piano can make a big difference to some ears. While I know that repeated patterns in music can create a soothing and hypnotic affect, I think repetition overdone on some of these pieces. I listen very carefully when I’m reviewing and that can be a bit of a problem with music for meditation. It is very apparent that many people really like this album, and that’s great and I hope it continues to do well. I really like three of the pieces on Starlight Dreams. “Invocation” is an emotional song of love and longing written for an unknown “true love” Karen Biehl knew was out there somewhere. The piano itself is the only weak point in this piece, which is lovely. “Starlight Waltz,” is quite different from the other tracks and is a mysterious minor key waltz in an elegant romantic style. I also really like the closing track, the “full version” of “Meditation on a Moonlit Lake.” The additional digital instrumentation and atmospheric sounds send the piece soaring, evoking peaceful images of moonlight shining on a quiet darkened lake. Starlight Dreams is available from Amazon, iTunes and CD Baby as well as many of the streaming sites.